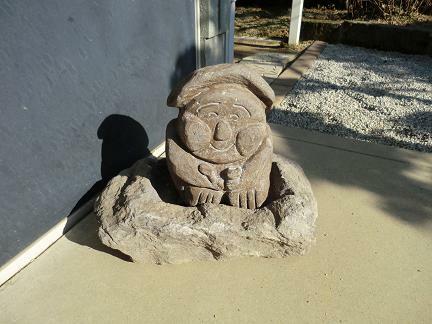 My husband bought a small stone "God of a rice field" statue at the end of last year. I do not know where he obtained it in detail, but it is an imitation, not a genuine, he said. When he was driving in the old Satsuma Clan region (present-day Miyazaki Prefecture ) about thirty years ago, he saw many stone statues here and there. They have been interesting to him since then, and he never forgot them, he said. They say the God of a rice field was made to pray for rich rice harvests. It holds a rice scoop in its right hand and a rice bowl in its left hand. Farmers' lives in the Edo era used to be very severe because they had to pay much rice as a tribute to the ruler. The expression of the statue looks both sad and happy to me. They say there are about one hundred and fifty stone statues for a God of a rice field now in Ebino city. The one my husband obtained smiles. By the way, my son whispered about it to me when he looked at it in my garden, ''I would　have used the cost of the statue for living costs," though he understood that his father likes the statue a lot. And my grandson pointed to the statue and shouted happily, "It's Anpan-Man". My husband wanted to put it at the center of the garden, but now it sits in a sunny and inconspicuous place in the garden. I think of farmers in the Edo era whenever I see the God of a rice field in the garden.